Cast: Adam Sandler, Kate Beckinsale, Christopher Walken, Sean Astin, David Hasselhoff, Henry Winkler, Julie Kavner. Story: An overworked father finds a remote control that operates his own life. 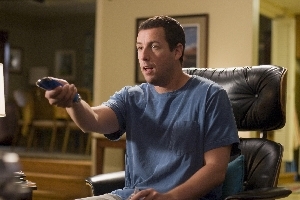 Click features Adam Sandler using a remote control that works his own life. It should be terrible, right? Yet somehow it succeeds in being funny and moving and surprisingly good. Adam Sandler movies never require much in the way of thought and Click is no exception. Concentrating on the fun parts in the first half, then moving to the sloppiness in the second, the idea of controlling your universe with a remote is vastly under-used, but you don't really notice that at the time. The story of a family man who works too hard at the expense of his kids is hardly novel either, but at least here it's done with tact and more than a little sensitivity. It's not a lesson you can learn from a movie - you have to work it out for yourself - but that doesn't stop these movie boys from trying. 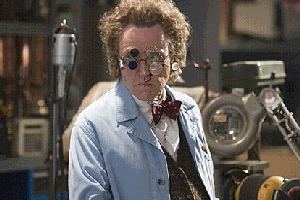 Sandler is joined by some new faces to his team, notably Kate Beckinsale (Underworld) and the always watchable Christopher Walken. Henry Winkler's second career as a funny man continues apace, though I would have liked to see him used considerably more than he is here. Director Frank Coraci is no newcomer to this kind of movie, with previous directorial credits including The Waterboy, The Wedding Singer and Around The World In 80 Days, all of which were far better than the sum of their rather lacklustre parts. I don't know what kind of fairy dust he uses to make such good cakes out of such tawdry ingredients, but whatever it is he should bottle it and sell it. If you sit down and try and pick holes in Click, you'll be there all day, but for some reason it doesn't matter. David Hasselhoff never really tries to act properly but it's OK - Sean Astin (that little hobbit squirt) has done far better in the past and the story is just preposterous, but I don't care. It was fun, it was sad and it was all very fulfilling, despite being far from perfect in very many ways. On paper, Click seems complete rubbish - but in reality it somehow manages to pull it all together to make a rather good comedy drama. Click is much better than it has any right to be. Testosterone Satisfaction Rating: 0/5 - just some mild swearing. To enjoy this film you should: have a little part of yourself that hasn't been destroyed by the weight of the world yet. Click was released in the UK on 29th September.